Rediscover the magic of black & white photography and enter into the universe of silver halide film thanks to DxO Labs’ advanced calibration technologies. 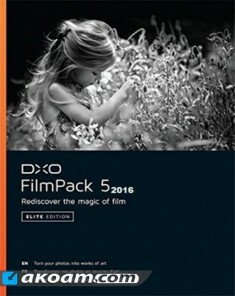 DxO FilmPack faithfully reproduces numerous black & white films such as the celebrated Kodak Tri-X , Fuji Neopan , Polaroid , etc. Depending on the kind of rendering you want, choose a black & white film based on its contrast, grain, or gray nuances. Up to 27 black & white silver halide films are at your disposal to help you express your artistic sense or to revisit an old familiar style. 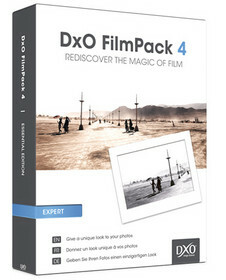 DxO FilmPack brings to your digitial images the colors, the saturation, the contrast, and the grain of the most famous slide and color-negative films. Rediscover the softness of Kodak Portra 160 NC for your portraits and events, the magic of Polaroid for imitating old vacation photos, and the brilliant colors and contrast of Fuji Velvia 50 for your macrophotography. Up to 39 color analog films are available to wake up the poet in you! In addition to more than 60 traditional film renderings, DxO FilmPack also offers you some original creative renderings! Have fun trying out the 39 Designer color and black & white presets included in the Expert edition (12 included in the Essential Edition). Vintage effects, aged photos, and improbable tints lend an individual style to your photos. With the Poetic rendering, apply the warm tones and faded colors of an old American photo series. With Red Tone, warm up the colors so as to capture the evening light. Choose Photo 1900 to capture the sweetness of sepia complemented by a fine grain. Add grain to your digital photos to restore all the authenticity of an analog film. Give character to your images and discover a new photographic dimension thanks to DxO FilmPack’s many available grain effects. Using DxO FilmPack’s denoising tool, tamp down the digital noise in your high-sensitivity images and replace it with an authentic film grain. Give body and texture to your photos without detracting from their natural look and quality. -Easily apply a large number of effects to your images by using numerous, simple, one-click settings. -Toning: Use a sepia dominant to age your black & white images. -Color filters: Apply a subtle black & white conversion to your color photos. -Textures: Age your images with scratches, spots, and crumpled paper effects. -Light leaks: Simulate film cartridge light leaks. -Frames: Make your photos stand out with mats and film border effects. -Creative vignetting: Reveal the spirit of your digital images. -Creative blur vignetting: Reduce the depth of field to draw attention to your subject. Easily apply a large number of effects to your images by using numerous, simple, one-click settings. -Black & white control: Use the channel mixer to bring out the nuances in your photos. -Color control: Use the Hue/Saturation/Luminance feature to have fun with colors. -Tone Curve: Perfectly master the tones contrasts, and luminosity of your images. -Vibrancy: Apply intelligent saturation to your images. -Micro-contrast: Boost the local contrast. -Cropping: Adjust the final size and composition of your image. DxO FilmPack can be used both as a standalone application and as a plugin for Adobe Photoshop , Adobe Photoshop Elements , Adobe Photoshop Lightroom , Apple Aperture , and DxO Optics Pro. In standalone application mode, you can directly process your TIFF and JPEG images in just a few clicks. In plugin mode, you can maintain your workflow while enhancing your Adobe or Apple solutions. In plugin mode for DxO Optics Pro, you can also directly process your RAW images! 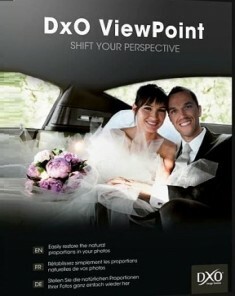 Easily process all of your images using DxO FilmPack’s intuitive interface. Open your image and then click on the preset of your choice: the rendering is immediately applied. You can apply a black & white conversion to your photo in just one click! Use different display options to compare your original and corrected images. Show or hide the different panes according to your preferences, and easily access effects and advanced settings grouped in the tabs in the controls panel. Batch processing - DxO FilmPack lets you use the same settings to process a large number of images in just a few clicks, thereby guaranteeing that your images will have a homogenous look. Printing - Save time and perfectly reproduce the processing settings you’ve applied to your images by printing them directly from DxO FilmPack. Custom presets - DxO FilmPack lets you save the renderings that you have created. Save your settings for intensity, grain, and contrast and then apply them to other images in your library. Preset import/export - Use the export feature to share your processing parameters with other DxO FilmPack users. Borrow a look created by another user by importing the preset into your library.